At its recent Innovation Day, Intel announced a range of new products that emphasized the company’s strategic transition to a data-centric approach. Next generation products like Xeon Scalable, Agilex 10nm FPGA, and Optane persistent memory all offer impressive performance enhancements and are indicative of Intel’s leading design, architecture, and software capabilities. The event reinforced Intel’s technological and product depth as well as leadership in AI and autonomous driving. New CFO George Davis departed Qualcomm to join Intel bringing extensive semiconductor industry experience. Current valuation at ~11x is attractive relative to both the historical multiple and Intel's growth runway. Intel (INTC) is the world leader in processors for both AI and autonomous driving and holds a dominant market position in these markets with a microprocessor chip market share around 80%. Over the next decade, the growth in microprocessors is expected to exceed the growth of the overall semiconductor industry and become a $300 billion data-centric total addressable market (NYSE:TAM). This should drive revenue growth for Intel over the next several years. The company also has a long-term focus on high growth markets in the development of AI products, autonomous driving, and 5G wireless. Moreover, Intel recently became the exclusive modem provider to the iPhone. Valuation is attractive with Intel shares trading at a discount to its peer group, and its historical average – forward price-earnings (NYSE:PE) ratio is currently ~11x versus the five-year historical average of 13 times. Intel is one of the largest semiconductor makers in the fields of computing, networking, data storage and communication solutions worldwide. Based on 2018 sales of $72 billion it has the largest market share in the industry. The company’s fundamentals are accelerating as evidenced by the record revenue and earnings per share it produced in its most recent quarter. Intel achieved 13% revenue growth last year and passed the $70 billion mark for the first time. Records were set across most business lines including client compute, data center, internet of things (IoT), memory, programmable solutions, and autonomous driving (Mobileye). Data center growth in the double-digits (20% in 2018) has been particularly impressive due to the strong demand from cloud service providers and a growing market share with communication service providers. Intel’s Innovation Day on April 2nd showcased its data-centric portfolio of next-generation products. The company introduced seven new products although many in attendance considered the impressive list of customer testimonials to be the highlight of the event. The likes of Amazon, Google, Microsoft, and SAP all provided a vote of confidence in Intel for its latest innovative product offerings in discussing various performance and cost-of-ownership benefits. Intel’s strategic direction is evolving into a transformation from a computer (PC) centric company to a data-centric business model. The company discussed the key demographic trends that are supportive of data growth along with the opportunities in cloud computing applications and 5G networking. Intel introduced second generation Xeon Scalable CPUs that include integrated learning acceleration via Deep Learning Boost. The new Cascade Lake suite of high-performance AI processors began shipping in the 4th quarter, and the company is planning 50 new products at the lowest cost per core of any recent Intel launches. It is estimated that customers will experience a 30% volume performance improvement over the first generation offering. The substantial performance benefits of the next-gen Xeon Scalable should help drive strong second half revenues and give Intel a competitive edge over Advanced Micro Devices’ EPYC launch due for this summer. It also announced a new 10nm FPGA product (Agilex) that will compete directly with Xilinx’s 7nm offering. The new FPGA uses Intel’s EMIB 3D packaging technology and looks to be in a good place to address the emergence of 5G networking and data center acceleration. The long-awaited 10nm CPUs continue to show yield progression. The Agilex product is estimated to yield a 40% performance increase while at the same time reduce power consumption by 40%. Intel forecasts that its Ice Lake 10nm CPU will be in devices and on the shelves in time for the 2019 holiday season. The new Ice Lake products are likely to extend the company’s leadership in the CPU market. Intel’s FPGA accelerators are in an excellent position to see positive market adoption and represent a competitive moat around the company’s core CPU business. New memory products including Optane SSDs and Optane DC persistent memory were announced. Two new Optane SSDs were introduced along with Optance Persistent Memory which has the potential to be a disruptor in-memory architecture. The persistent memory product requires a new controller, new firmware, optimized software, and ecosystem support all of which are new revenue sources that Intel has brought to the market. The company performed its first implementation of the Optane persistent memory product for data center applications as an Ethernet to Optane solution. This is part of Intel’s joint venture with Micron. Google was the first to receive persistent memory technology and uses the product for some of its workloads. Complementary platforms for storage and networking will significantly expand the company’s market opportunities and drive data-centric growth. After former CFO Bob Swan was appointed as CEO earlier this year, Intel announced the appointment of George Davis as the new CFO and EVP of the company. Davis left Qualcomm where he had the same role and was also formerly the CFO at Applied Materials. On the one hand, given Swan’s success in managing Intel’s financials and continued leadership involvement as CEO, you wouldn’t expect the hiring of Davis to have much of an impact. On the other hand, Davis brings vast semiconductor industry experience to Intel so this can certainly be viewed as a positive. Intel has brought in a CFO that probably has more direct industry experience than any other candidate out there. During Swan’s tenure as CFO, he emphasized cost management and free-cash-flow improvement. It will be interesting to monitor if Davis’ financial philosophy closely matches Swan’s approach. Overall, we think investors should look past near-term cyclical concerns as the upside from Intel's "Data-centric" portfolio (DCG, IoTG, NSG, PSG) is substantial long-term. Intel's Innovation Day event was a timely reminder of Intel’s technology, product breadth and leadership in AI. 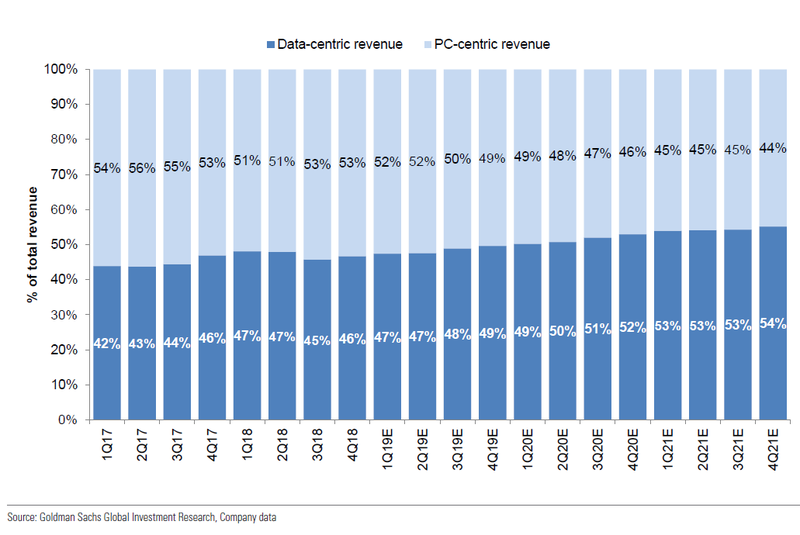 While we acknowledge near-term cyclical headwinds and the risk, this poses to gross margins, we think we are on the cusp of Intel's next leg of growth via its data-centric segments across an ever-expanding addressable market. We believe Intel's competitive advantages are still very much intact, and as a market leader, Intel will be in a prime position to leverage its technology portfolio into further growth. At ~11x fwd PE, and a long growth runway ahead, we think Intel is worth a look.